The Mapping of Chalfont St Giles. Maps are a fascinating source of information about a place. The better and the earlier a place is mapped the more we can understand of its history. Chalfont St Giles is mapped as well as most places from about 1820 when the initial Ordnance Survey was published, but as far as I can establish, prior to that time only two significant 18th century estate maps exist, both of the Vache estate. The only other early coverage of the parish is within Buckinghamshire county maps but these tend to give relatively little detail. The most detailed early map of the whole parish is the Tithe map. (See the page on this site The Tithe award and map of 1840).This shows all the roads, buildings, and field boundaries as they existed at that time. The accompanying apportionment schedule lists the names of owners and occupiers of each piece of land together with the land area and its assessment to rent charge. An original and two copies were always made. The version at the Centre for Bucks Studies at Aylesbury is one of the copies and is only of moderate quality. It was surveyed by Ephraim Clark and was a expansion and correction of one held by the Rector dated 1817. No copy of this earlier map has been found. The ordnance Survey's first survey of Buckinghamshire was made around 1800. The result exists in the form of manuscript surveyors drawings at a scale of 2 inches to the mile. The originals are at the British Library and are digitised on its website. (Search for the High Wycombe sheet.) Scanned copies are at the Centre for Bucks Studies. This survey was eventually published in 1822 as the OS "Old Series" 1 inch. The Chalfonts fall into Sheet 7 which covers from London City westward to Maidenhead, north to Wendover and south to Staines. The major difference between the manuscript drawings and the published map is that the drawings include field boundaries which the publish map does not. The "Old Series" was publish in many states right up to the 1880s and was modified frequently to include the expanding rail network and the expansion of the built up area of London. It was not updated to include changes in the rural areas such as Chalfont St Giles throughout the long life of this map. So one has to aware that if one is looking at a rural area on an Old Series map one is always looking at the landscape as it was in 1800 regardless of the date of publication. The OS started to resurvey the whole country from 1841 but it took them 40 years. Chalfont St Giles was resurveyed in 1875/6 and Chalfont St Peter a year later. The result was published as the 25 inch County series Large scale plans. (For Chalfont St Giles refer to sheets 43/7,10,,11,14,15, and 48/2,3,6,7.) These are available on microfilm at Centre for Bucks Studies. This resurvey also resulted in the "New Series" 1 inch map of 1886 and the Chalfonts are covered on sheet 255 titled Beaconsfield. Facsimile editions are published by Alan Godfrey Maps. In 1897 a further revision to include changes to the landscape since 1875 was made and published at both 6 inch to the mile format (sheets 43 and 48 for our area) and as a "Revised New Series" 1 inch map. The 6 inch is widely available in libraries and is the most useful for historians. Twenty six years later in 1923 the survey was revised again to take account of the substantial changes that had taken place since 1897. This appeared in print as the "Popular Edition". Sheet 106 titled "Watford" cover the Chalfonts. 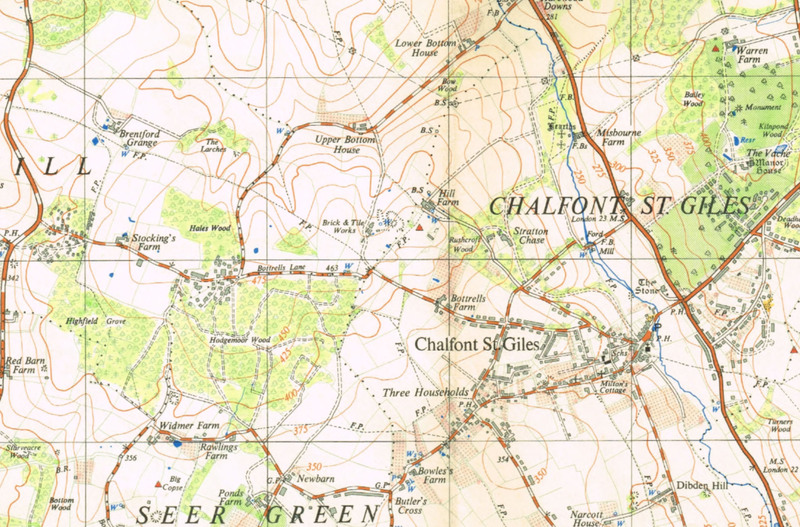 There is also a tourist map version "The Chilterns" which includes the Chalfonts but is from the same survey. There was however an interim survey of new roads or building development since 1897, carried out in 1911/12 for the National Land Valuation. This is only at the 25 inch scale and only some were published in 1912, the remainder are in manuscript only. This a very interesting period for the Chalfonts and these maps can be found at the CBS and at the National Archives. But beware of later editions which may have been substituted for the originals. So the last full revision before WW2 was in 1923. An emergency update survey was carried out in 1939 but was never publicly available. However the results were incorporated with aerial photo updates after the war to produce a "Provisional" edition of the 1:25000 or two and half inch to the mile map published in 1949. This is very interesting but has to be treated with great caution. It is supposed to show the state of roads and buildings just after the war. It shows for example the huts in the Vache and the buildings in Hodgemoor woods, but excludes other housing in Amersham that was built just prior to the war. Here is an extract showing the village and extending across to Hodgemoor. You can download the full sheet SU 41/99 but it is a large 7Mb file and so may take some time to download. This "Provisional" edition was republished around 1960 with further piecemeal updating of roads and buildings but now using the National Grid lines rather than Latitude and Longitude. The next comprehensive resurvey of our area took place in 1961-3 and formed the basis of all maps such as the Pathfinder series, Explorer and Landranger. These were all subject to continual partial revision especially of roads but not necessarily exact at the date of publication. One can therefore not rely on any of these maps to be a true historical snapshot of any one time. Today modern maps are often accessed online such as Goolemaps although these lack the detail that OS maps give. Unfortunately Chalfont St Giles village is at the corner of major OS sheetlines. This means that for large scale historical mapping one often has to look at four maps. It must be stressed that the use of OS maps as a definitive historical record is fraught with difficulty and for serious study one needs to look at various revisions of the base scale (1:2500) sheets. It is also a complex subject and if any serious study is to be undertaken I recommend referring to "Ordnance Survey Maps: A concise guide for historians" by Richard Oliver published by The Charles Close Society 2013. Having said that OS maps remain a wonderful picture of the country and I would not be without them. Prior to the ordnance Survey and tithe map we have to rely upon estate maps and county maps. Only two significant estate maps appear to survive. Both are of the Vache estate. One in the Centre for Bucks Studies is dated 1792 (Ma 280) and was prepared for Admiral Palliser. This map is quite small but shows all field boundaries within the estate. Additionally there are smaller maps including the Wingfield estate of which only a small part fell within Chalfont St Giles. Finally mention must be made of "Buckinghamshire in the 1760s and 1820s: The County Maps of Jefferys and Bryant". These are large format county maps and are well worth studying. A facsimile in the form of a 32 page A3 book has been published by the Bucks Archaeological Society. This print is a section of the Chalfont History website. Do you have comments, questions, or more information about this subject? Click here to access a form to send them to me.